To install the new sensor with the wire you can use an O2 sensor socket. It comes notched in the side so the wire can go somewhere. The sensor only needs to be tight enough to not leak. Don't go crazy with the tightness! Plug in the new sensor into the plug and push in the red part. 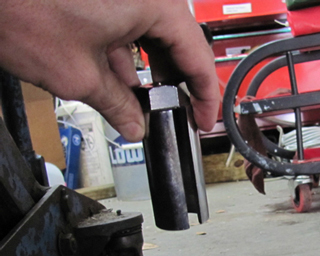 Now use some brake cleaner and clean up the oil from the side of the block. This will allow you to see the new sensor from above and make sure it isn't leaking! Now reinstall the starter. Once I got it in place, I slightly tightened the lower nut and then went to the top bolt. I fully tightened the top bolt and then put the 10mm bolt back in place to locate the power wire. From under the car I then installed a new plastic zip tie to hold the sensor wire and power wire to the starter as before. Finally, I connected the wires onto the starter and alternator, tightened the lower starter bolt, and installed the intake support bar. 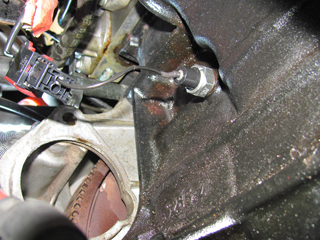 The last step is to cleap up the oily mess from the oil pan so you can see if the leak has been fixed!